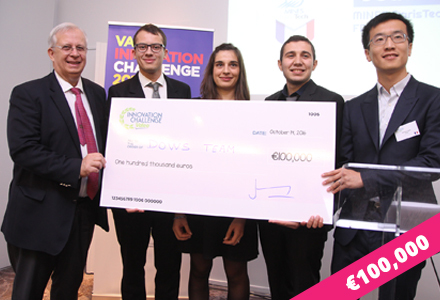 A team of students from MINES ParisTech, composed of 4 doctoral students from the Center de Robotique and a pupil of the last year of the civil engineer- ing cycle, won a first Valeo Innovation Challenge 2016 in the “technological innovation” category. The team receives this award after a competition of more than 1300 proposals. Congratulations to Eva Coupeté, Florent Altché, Philip Polack, Sofiane Mahiou and Xiangjun Qian! All results are available on the Valeo Challenge Innovation website.